On this date* in 1882 A.A. Milne, author of Winnie the Pooh, was born. When I think of Winnie the Pooh I think of Eeyore the Donkey. 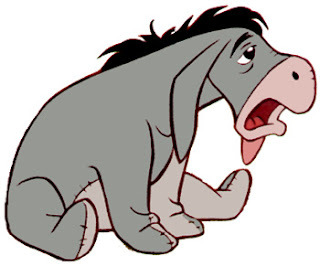 When I think of Eeyore the Donkey I think of Carl, and elderly man who lives around the corner. Carl, like Eeyore talks in a deep slow voice. Carl is tall and slim. He is 87 years old. He is a very kind humble person… very gentle. I have know Carl long before he moved to this neighborhood. He was my father-in-law’s good friend, and sort of a running buddy years ago. Carl owned a lot of land, sold it, and is now on the board of directors of a bank he partly owns but you would never know it, as kind and gentle as he is. He and his wife live in a humble house in and older neighborhood. Carl is almost blind now. I see he and his wife at the grocery store and always talk to them. He walks along with her, holding on to the buggy. I don’t think he can see beyond 15 or so feet in front of him. One morning while Willow and I were walking I saw ahead of me Carl in his driveway looking for the morning paper, or I think that what he probably was doing. He turned around and slowly walked up his driveway to his house. When I got even with his house, he was already inside. I saw the paper in the gully away from the driveway. I thought if I carried it up and rung the doorbell it might scare them – it was before daylight. So I placed it in the middle of his driveway, so the next time he walked down it would be plain view. Later I was thinking as tall as Carl is, it might be hard for him to bend over in the ditch and get his paper when it ends up there. So, now every morning, on our walk, I always make it a point to go by Carl’s and if his paper is in the ditch, I put it in the center of the driveway. Sometimes it is, sometimes it isn’t. My next door neighbor is and elderly lady, I always get her paper and put it on her car hood in her carport so she won’t have to walk long or bend over. The elderly neighbor on the other side of me, when it rains only, I put his paper up under the overhang of his house so it won’t get wet. I am the morning newspaper Leprechaun! Very kind of you, Eddie. It only takes a second....shoot, when we get elderly maybe someone will return the kindness. Do Unto Others As You Would Have Them Do Unto You comes to mind. The Invisible Man Strikes the Varsity Restaurant! Where in the World is Banksy?